How Far Can American Exceptionalism Go? U.S. hegemony appears to be in relative decline. How will it continue to lead on the global stage? 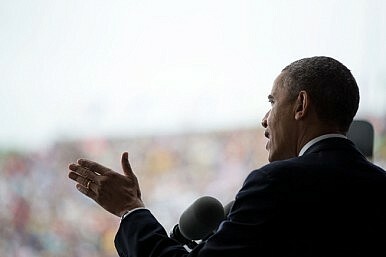 On May 28, 2014, U.S. President Barack Obama delivered the commencement address at the U.S. Military Academy at West Point to defend his foreign policy. In the speech, Obama concluded that the source of U.S. leadership rested on four tenants: namely the ability to freely use its military power, a global network of alliances and partners, the ability to build and maintain institutions and the willingness to act in order to maintain human dignity. However, the dilemma the U.S. faces is structural and not easily overcome. First, wars in Afghanistan and Iraq have exhausted the country and imposed a huge financial burden. There seems little chance either conflict will end in success. Many Americans think the U.S. has failed. According to a poll released by the Pew Research Center on January 30, 2014, 52 percent of respondents believed that the U.S. failed to achieve its goals in the wars in Afghanistan and Iraq. Third, the U.S. political system is inefficient. The U.S. founders considered the core of the U.S. political system to be fairness, equity, and the rule of law, even at the expense of efficiency. However, they would not have expected there to be so little progress in fairness after more than 230 years of development. Witness the Occupy Wall Street movement against “the 1 percent” in 2011. Meanwhile, the political system has become increasingly inefficient in recent years. Washington is in gridlock, and the American people have lost confidence and patience in both main parties. This inertial thinking of “American leadership” dominates Obama’s international vision and strategic planning. This is partly because the U.S. has been an international leader for decades, solidifying its “leadership” self-identity, and partly because of a firm belief in American exceptionalism. Obama himself has stated that he believes in American exceptionalism with every fiber of his being. However, time changes things significantly. If the U.S. continues to hold onto this view of itself and the world today, it will inevitably be frustrated. In his speech, Obama pointed out that now the real question is not “whether America will lead, but how we will lead.” He did not answer his own question. Perhaps he did not know. Fundamentally, then, Obama’s strategic dilemma lies in the contradiction between the unwavering intention of the U.S. to lead globally, and its declining ability to do so. Chen Jimin, Ph.D is an Assistant Research Fellow for the Institute for International and Strategic Studies at the Party School of the Central Committee of C.P.C. The views presented here are the author’s own.